(Full review 1/19/17) 1978 Jove mass-market with cover art from the always excellent Rowena Morrill. This version of the book doesn't feature all the stories listed on this page (which is for the Arkham House editions). It includes: "In the Vault," Pickman's Model," "The Rats in the Walls," "The Music of Erich Zann," "The Haunter of the Dark," "The Dunwich Horror," and "The Thing on the Doorstep," most of which are top-tier Lovecraft, imo, ones I hadn't read in 20 years or so until now. It also fe (Full review 1/19/17) 1978 Jove mass-market with cover art from the always excellent Rowena Morrill. This version of the book doesn't feature all the stories listed on this page (which is for the Arkham House editions). It includes: "In the Vault," Pickman's Model," "The Rats in the Walls," "The Music of Erich Zann," "The Haunter of the Dark," "The Dunwich Horror," and "The Thing on the Doorstep," most of which are top-tier Lovecraft, imo, ones I hadn't read in 20 years or so until now. It also features an informative intro from 1963 by Arkham House co-founder August Derleth (or "Der Leth" as he's mistakenly called on the cover). I thought some of the tales would lose a little of that sense of awe (or "frisson," as weird fiction authority ST Joshi would say) I felt as a teen, but I was wrong. "Pickman's Model" was as effective (and horrifying) as ever, but "The Thing on the Doorstep," which closes the collection, especially creeped me out this time around, as it involves one of my biggest fears: the loss of one's own mind/loss of control. My appreciation for "Erich Zann" grew greatly as well, and is now one of my all-time favorite Lovecraft stories. It's not especially "scary," but it is straight-up weird -- very proto-Ligottian in a way, with its (now typical) strange, hidden "Ligotti-esque" town-- and is pretty much unlike anything else he's written, to my knowledge. The only stories that didn't really hold up as well for me were "In the Vault" (short, decent-but-standard graveyard horror) and the title story, which seemed much too long, written in that dry, overly clinical style that ole' HP sometimes used, and which I really have to be in the right mood for. Still, this a must-own for collectors of vintage Lovecraft paperbacks, and even the two tales that didn't really float my boat as much aren't bad by any means. 4.5 Stars. 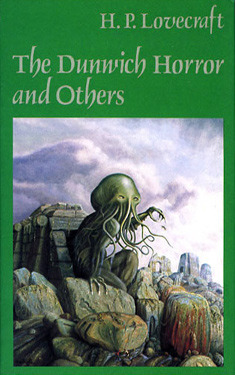 This book was my first exposure to H. P. Lovecraft, way back in 1991 or so. I was eleven years old. The book shook my world to its very foundations. At the time, isaac Asimov was my favourite writer, but Lovecraft showed me how to appreciate moody, lapidary writing full of atmosphere and dripping with menace. I gave the book five stars mostly because of its revelatory impact on me and my personality, even though if I had discovered Lovecraft for the first time today, especially being familiar no This book was my first exposure to H. P. Lovecraft, way back in 1991 or so. I was eleven years old. The book shook my world to its very foundations. At the time, isaac Asimov was my favourite writer, but Lovecraft showed me how to appreciate moody, lapidary writing full of atmosphere and dripping with menace. I gave the book five stars mostly because of its revelatory impact on me and my personality, even though if I had discovered Lovecraft for the first time today, especially being familiar now with writers like Clark Ashton Smith, a contemporary of Lovecraft's who was admittedly a much better stylist; Fritz Leiber, who writes about real people with real emotions in his horror stories; Thomas Ligotti, whose sense of alienation and misanthropy in the face of an uncaring cosmos is almost unparalleled; William Hope Hodgson, who journeyed to unfathomed depths of time and space and brought back something too horrible to contemplate a good thirty years before Lovecraft did, I might have knocked the rating down by one star. But really, none of those authors were even remotely in my sights at the time, and reading these stories today, I believe most of them still stand up very well. True, none of Lovecraft's characters feel like real people. But this connects with a theory I have about horror fiction: the "blank slate" approach to character works very well in horror precisely because these are "empty shells" of people, which your imagination can fill at its leisure. When we have pages and pages of background about a person, that person becomes integrated and real to us, in a sense, and although we can feel sadness when such a fictional character experiences loss or pain or death, we never for one moment think of that person as "us", and our minds don't really pull the trick of substituting that made-up individual with our own beings. In stuff like Lovecraft's fiction, or David Lindsay's book A Voyage to Arcturus, the fact that the people written about are ciphers that never have lives outside of the story means that that space can be filled, unconsciously perhaps, with our own experiences, and so the stories become all the more disturbing and get under the skin with surprising ease. Or maybe all that's just me. But at any rate, here we really do have some of Lovecraft's best fiction. not all of it, mind you, but more than enough to get a taste and then some of what the man was all about. Creepy, short pieces with clear Poe influences, like "In the Vault" are here in a small number. Frightening tales of descent, of degeneracy into screaming madness, oh, most certainly. Stories about the unknowable horrors that lurk beneath the sea and wait for the right moment to call the minds of the pitiful human herds to do their bidding! Great cosmic beings, winging their way towards us, on unfathomable missions whose principles alone would transform the strongest men into gibbering wrecks! Ancient, cold, aloof beings who survive time and death to take possession of human psyches! All can be found within the forbidding pages of this tome! I read these for the first time, late in the evening or at night. Mostly, I remember waiting to be picked up from school, in a room full of other ten or eleven-year-olds, completely shut off from everything. I wasn't interested in a damned thing but finishing these stories. IN particular, I remember reading "The Color out of Space" in just such an environment, and finally going home with a sick, queazy feeling, wondering if I would hear a strange dragging noise in the night, and I would tip-toe quiveringly down the stairs only to find my family collapsing around me, turning to piles of grey dust. "The Whisperer in Darkness" read to me like a science fiction story, but one of a kind with which I was completely unfamiliar. Beforehand, my ideas about space were wonderous, excited. Now I thought to myself, "what horrors could really be out there?" And that ending! "The Shadow over Innsmouth" also chilled me to the bone, and yes, I think it's much more effective than the film Dagon, which borrows a lot from this tale. it's also one of the more action-oriented pieces in the anthology, so if you're afraid to tackle Lovecraft because you've heard he's slow and pedantic, perhaps start with this one. I love how the narrator manages to escape from the horrors confronting him, only to find that a worse fate has been waiting for him all along. These are the best sorts of endings in horror, and represent the pinnacle of what the genre is really all about. I'll be coming back to this book. 4.5 stars. Outstanding collection of H.P Lovecraft stories. The Dunwich Horror is an amazing story that reads as well today as when it was first written. Lovecraft was a unique talent and his stories are just a ton of fun. The Rats in the Walls has always been my personal favorite. As Howard wanted, many have tried over the years to expound on his Cthulhu Mythos; few even came close. I believe he named man's strongest emotion as Fear, with the greatest Fear being that of the unknown. Did you ever overcome your own fear enough to actually Look under your bed when you just Knew Some Unknown Thing was there? Nah, neither have I. Listening as I work on computer projects https://youtu.be/7NydhWxfDeU?list=PLG... I'm becoming addicted to HP Lovecraft stories. Like a lot of other mopey adolescents, I devoured H.P. Lovecraft when I was in high school; I owned several collections of his short stories and novellas. I remember loving his unwholesome, horrifying vision of Earth's past, present and future. Inspired by an article that recently appeared on a favorite pop culture website, I decided to say hello to Howard P. again. Iä! Iä! Big mistake. I forgot he has just one plot: someone (usually a middle-aged professor at witch-haunted Arkham's Miskatonic U Like a lot of other mopey adolescents, I devoured H.P. Lovecraft when I was in high school; I owned several collections of his short stories and novellas. I remember loving his unwholesome, horrifying vision of Earth's past, present and future. Inspired by an article that recently appeared on a favorite pop culture website, I decided to say hello to Howard P. again. Iä! Iä! Big mistake. I forgot he has just one plot: someone (usually a middle-aged professor at witch-haunted Arkham's Miskatonic University) recalls, with the help of supplementary materials (diaries, letters, phonograph recordings, newspaper clippings), an encounter with gibbering beings from outside our solar system/the afterlife/below desert wastes or oceans. This someone is usually on the brink of madness by the end of his tale. The man had an incredible imagination; it's too bad his stories, when read back to back in a collection, are so annoyingly repetitive. Oh well. I'm going to wait a bit before tackling Lovecraft's masterpiece, At the Mountains of Madness. Cthulhu fhtagn! love this book! it genuinely gave me the creeps and was interesting to read. I would highly recommend it. the story sucked me in and I loved the finale ending. Kralın yeri çok büyük. Kısa zamanda tüm eserleri sindirilecek. i was far, far too hard on old howard philips that last time around. these stories are, with the exception of one or two of the shorter ones (which were just hilariously corny), marvelously creepy and moody and i totally understand now why he's considered the father of modern horror, or whatever. well, him and poe, anyway. the old-fashioned-ness of his language adds to the atmosphere of utter madness and terror, and i began to appreciate for the first time that the vast reaches of outer space ca i was far, far too hard on old howard philips that last time around. these stories are, with the exception of one or two of the shorter ones (which were just hilariously corny), marvelously creepy and moody and i totally understand now why he's considered the father of modern horror, or whatever. well, him and poe, anyway. the old-fashioned-ness of his language adds to the atmosphere of utter madness and terror, and i began to appreciate for the first time that the vast reaches of outer space can be horrifying, his characters contemplating so often that we don't know what the hell is floating and growing and plotting out there and all. hehe. i will be reading more from lovecraft in the future, i predict. Czailiście się na jakąś książkę bardzo długo, a potem byliście źli, że dopiero teraz się za nią wzięliście? Ja teraz mam dokładnie takie myśli. Dlaczego tak długo zwlekałam? Z drugiej strony chciałabym wymazać sobie pamięć i zacząć od nowa. To jest po prostu perfekcyjne. Nawet nie jestem w stanie wybrać kilku najlepszych opowiadań. No bo co, wszystkie tytuły mam wypisać? Must read dla wszystkich fanów grozy i horroru. Lovecraft jest oficjalnie autorem mojego życia. Życzę wam wszystkim, żebyście zna Czailiście się na jakąś książkę bardzo długo, a potem byliście źli, że dopiero teraz się za nią wzięliście? Ja teraz mam dokładnie takie myśli. Dlaczego tak długo zwlekałam? Z drugiej strony chciałabym wymazać sobie pamięć i zacząć od nowa. To jest po prostu perfekcyjne. Nawet nie jestem w stanie wybrać kilku najlepszych opowiadań. No bo co, wszystkie tytuły mam wypisać? Must read dla wszystkich fanów grozy i horroru. Lovecraft jest oficjalnie autorem mojego życia. Życzę wam wszystkim, żebyście znaleźli książkę dla was idealną, bo to niesamowite uczucie, którego nie jestem w stanie opisać. It's been years since I'd taken a look at Lovecraft, and in that time I'd become a rather large fan of Michael Moorcock -- far from a fan of Lovecraft. I wasn't sure if his (and others) opinion would color my enjoyment of this book, but I have to say, despite the similarity in subject matter these stories all have, some of these are just as thrilling as I remember, and Lovecraft's prose style isn't nearly as turgid as I'd remembered. They're formulaic, and the racism and xenophobia is hard to sw It's been years since I'd taken a look at Lovecraft, and in that time I'd become a rather large fan of Michael Moorcock -- far from a fan of Lovecraft. I wasn't sure if his (and others) opinion would color my enjoyment of this book, but I have to say, despite the similarity in subject matter these stories all have, some of these are just as thrilling as I remember, and Lovecraft's prose style isn't nearly as turgid as I'd remembered. They're formulaic, and the racism and xenophobia is hard to swallow, but if you're looking for exciting, and gruesome tales of cosmic horror, Lovecraft's still the best, and this is about as good a collection as you can expect to find. Świetne tłumaczenie. Pomogło tam, gdzie nie miałam już siły walczyć z oryginałem. This is a collection of short stories written by H.P. Lovecraft. Some of these stories belong to one world. These stories are mostly supernatural with a few science fiction. They are all told in first person and it is recounting of a previous experience. I picked this up because I read one of the short stories takes place where my mother grew up. It was a complete surprise to discover that Lovecraft's work is the basis for so many of today's entertainment like television shows, music, and video g This is a collection of short stories written by H.P. Lovecraft. Some of these stories belong to one world. These stories are mostly supernatural with a few science fiction. They are all told in first person and it is recounting of a previous experience. I picked this up because I read one of the short stories takes place where my mother grew up. It was a complete surprise to discover that Lovecraft's work is the basis for so many of today's entertainment like television shows, music, and video games. This man had a beautiful way of writing. It is true that it can be a little wordy but it painted a vivid picture of the setting and events. I felt the tension that the characters were feeling as they are introduced into a new world that defies explanation. I really liked how the characters are shocked and confused by this introduction and did not know what to do. It felt realistic as one would be when confronting the unknown. As I went from story to story I recognized his influence in some of my favorite forms of entertainment like Buffy the Vampire Slayer and this just added to my enjoyment. A rating of four stars for a collection of short stories is probably the highest praise I can give. I feel like a collection will contain an even number of stories I enjoy and ones I do not. That is not the case with this one. The good definitely outweigh the bad. I enjoyed everything in this collection. 4/5 Como es habitual en Howard Phillips Lovecraft, nos encontraremos con una obra enfocada en el suspenso, misterio y la fantasía. ¿Quién o qué es la criatura que aterroriza a la población Dunwich ? Wilbur Whateley, con características corporales muy extrañas e hijo de una mujer desfigurada crea un misterio en la comunidad sobre su verdadera personalidad. Su abuelo, el Viejo Whateley, exteriorizó en muchas ocasiones que el pequeño Wilbur nombraría a su padre desde la cumbre de Sentinel Hill. Ademá 4/5 Como es habitual en Howard Phillips Lovecraft, nos encontraremos con una obra enfocada en el suspenso, misterio y la fantasía. ¿Quién o qué es la criatura que aterroriza a la población Dunwich ? Wilbur Whateley, con características corporales muy extrañas e hijo de una mujer desfigurada crea un misterio en la comunidad sobre su verdadera personalidad. Su abuelo, el Viejo Whateley, exteriorizó en muchas ocasiones que el pequeño Wilbur nombraría a su padre desde la cumbre de Sentinel Hill. Además el viejo Whateley tiene un fuerte vínculo con las artes oscuras y esotéricas y no duda en enseñar estos conocimientos a su nieto. En esta obra descubriremos que es lo que oculta la familia Whateley en su morada ¿A qué se refiere el Viejo Whateley con que Wilbur nombraría a su padre en Sentinel Hiil? y ¿Cuáles son las verdaderas causas de la corporalidad excéntrica de Wilbur y por qué busca el Necronomicón? Un desenlace maravilloso lleno de suspenso y misterio en donde el lector está obligado a potenciar su creatividad para recrear morfológicamente al ser monstruoso que aterroriza a Dunwich y de cuál será el desenlace para esta población. This review has been hidden because it contains spoilers. To view it, click here. The thing that struck me first, and hardest, about Lovecraft was his endings. You know, instinctively, what is going to happen, but when it does - or more so, they way he writes it - you can't help but get goosebumps and feel chilled. Take, for example, the first story I ever read by Lovecraft, "The Whisperer in Darkness". Once Akeley sends his letter to Wilmarth that all is well, his ravings being a misunderstanding, you know something is up. Something doesn't feel right. How can someone, who wa The thing that struck me first, and hardest, about Lovecraft was his endings. You know, instinctively, what is going to happen, but when it does - or more so, they way he writes it - you can't help but get goosebumps and feel chilled. Take, for example, the first story I ever read by Lovecraft, "The Whisperer in Darkness". Once Akeley sends his letter to Wilmarth that all is well, his ravings being a misunderstanding, you know something is up. Something doesn't feel right. How can someone, who was once afraid for their life at the hands of things that literally go bump in the night, be so resolved and complacent that everything is now O.K.? Lovecraft expects the reader to question, to think that maybe something happened to Akeley, and it's the prospect of learning about this "something" that keeps us reading. In the end, of course, we find that the person sitting in the chair whom Wilmarth assumed was Akeley was NOT Akeley, but one of the Mi-Go impersonating him. With Akeley's very own face and hands. And at that point my skin burst forth with goosebumps, I set the book down, and covered my mouth. No book or short story has ever had that affect on me. (I loved it!) And yet through the latter half of the story I had the more-than-sneaking suspicion that Akeley wasn't really Akeley. The bandaged head and hands and feet! Of course it wasn't him! And in spite of that, in spite of knowing the ending before it happened, I was still terrified. That is the mark of a master right there. This is one example of many, but I'm going to mention a few more, for my memory's sake: Pickman's model being real. ("Pickman's Model") Asaph gnawing at Birch's ankles because he (Birch) cut Asaph's ankles off to fit him in the coffin. ("In the Vault") Olmstead turning into one of the creatures he so despises and fears and wishing to live under the sea with his brethren. ("The Shadow Over Innsmouth") Derby being put into the body of his months-dead wife. I still have a hard time wrapping my mind around the horror of such a thing. ("The Thing on the Doorstep") Delapore, crazed, eating Norrys. (Anything with cannibalism makes my skin crawl.) And still he hears the rats in the walls. ("The Rats in the Walls") I just have to read more by this amazing author. I first came upon the works of H.P. Lovecraft just before my teenage years. In many ways, to my young brain, these stories seemed not just dangerous but pornographic. In re-reading them now I'm not exactly sure I can explain it, because from today's more mature and jaded perspective they often seem naive and quaint if not actually clichéd. But when this were first published they very unsettling, if fact they were so convincing in just how unsettling they were that many people convinced themselve I first came upon the works of H.P. Lovecraft just before my teenage years. In many ways, to my young brain, these stories seemed not just dangerous but pornographic. In re-reading them now I'm not exactly sure I can explain it, because from today's more mature and jaded perspective they often seem naive and quaint if not actually clichéd. But when this were first published they very unsettling, if fact they were so convincing in just how unsettling they were that many people convinced themselves that the Necronomicon was a real book. So perhaps thinking these stories were so dangerous that they were pornographic might not be so far fetched. Still it was the fact that these stories took chance and went into the darker recesses of the human mechanism of fear that made these tales of unsettling horror into classics. Lovecraft may have been a racist (a fact that comes out much more clearly in his letters than his fiction) but perhaps that was in part why he was gifted at writing about and provoking xenophobic horror. it is festering xenophobia that breeds racism, and Lovecraft's fictions are a tribute to the fear and paranoia of the unexplained and unknown. Truly reach fodder with which to feed youthful minds. Just keep these tomes from the minds of those with too impressionable minds or else the xenophobic fear of the elder ones may very well drive the uninitiated to the brink of insanity, or even over the edge. This is my second installment of re-reading the essential H.P. Lovecraft canon. The volume contains 16 of my favorite stories including Pickman's Model, Rats in the Walls, the Dunwich Horror, and the Shadow Over Innsmouth. As always, Lovecraft's language is lyrical and dense - a wonderful way to be absorbed for a rainy afternoon or stormy night. What struck me most in re-reading this volume is the way that Arkham, Innsmouth, and environs are finally fleshing out - each story providing a single g This is my second installment of re-reading the essential H.P. Lovecraft canon. The volume contains 16 of my favorite stories including Pickman's Model, Rats in the Walls, the Dunwich Horror, and the Shadow Over Innsmouth. As always, Lovecraft's language is lyrical and dense - a wonderful way to be absorbed for a rainy afternoon or stormy night. What struck me most in re-reading this volume is the way that Arkham, Innsmouth, and environs are finally fleshing out - each story providing a single glimpse of a remarkably terrifying place. The characters are quirky and the terror is deep and sublime. If you are looking for action, this is not your book. If you are looking for a dark canvas painted with only the vaguest possibilities of the terrors that have slept on Earth since before mankind, then read on. There were no weak stories in this edition. Even those very short stories with extremely twisty endings - obviously written for Weird Tales - are enjoyable and memorable. I picked up the T.S. Joshi version from Arkham House published in mid-1980's, and I really like the retention of Lovecraft's spelling and word usage. Joshi treats the material well, and I recommend his version of this book. Overall, a very enjoyable read filled with dark terror, masterful storytelling, and a wonderful sense of what sleeps below. For me, this is the ultimate measure of quality in horror writing. No one before or since has matched the atmospherics that Lovecraft employs in this collection of his short stories. Whereas more recent decades seem to confuse horror with violence and gore, Lovecraft had the good sense to acknowledge that the unknown is infinitely more terrifying than the known. If your only familiarity with the genre is Stephen King and similar writers, you have no idea what Lovecraft is like. Bring your dictio For me, this is the ultimate measure of quality in horror writing. No one before or since has matched the atmospherics that Lovecraft employs in this collection of his short stories. Whereas more recent decades seem to confuse horror with violence and gore, Lovecraft had the good sense to acknowledge that the unknown is infinitely more terrifying than the known. If your only familiarity with the genre is Stephen King and similar writers, you have no idea what Lovecraft is like. Bring your dictionary with you--you'll need it! In France, he is studied in universities and considered better than Poe, and rightly so. In his native country of the USA, his tremendous genius and influence is only just now beginning to be recognized in the academic field. Some of Lovecraftt's best stuff is in this volume Myabe I shouldn't give him 5 stars but I love his stories. If you have a bit to spend the simplest way to get a farily coplete selection of his works, is to stick with the Arkham House copies. There are a gazilion different collection you can spend your money on but if you get the Arkham, you shouldn't repeat material. I make no claim this is great literature, but at the same time I tend to think he is under rated. Enjoy! I can certainly see why H P Lovecraft has a cult following as his style of writing is certainly distinctive as well as being engaging from the start. This selection of short stories was fun to read, especially as I don’t often read horror these days, but I was a little bored by the repetitive nature of the stories which is why this only got a 3 star rating. He was clearly a man obsessed with dark occult books such as The Necronomicon. Även om han blir lite väl mångordig och detaljerad emellanåt byggs stämningen upp gradvis för att sedan sluta med en kuslig twist. Read my reviews of any Lovecraft book; a racist and anglophile, but good and scary none-the-less! One of my favorite books by Lovecraft. I've read and re-read this book because I like it so much, specially The Dunwich Horror.